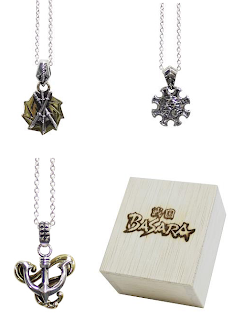 Shop listings are gradually revealing that a huge wave of Sengoku Basara merchandise is on the horizon. As well as the PS3 Sengoku Basara Triple Pack and the two new BGM CDs, preorder listings have recently appeared for some other goodies. The most exciting discovery for me is that we're getting a fifth Gakuen Basara manga anthology in March 2013. Details are tentative at the moment but it's listed at most major booksellers. The 164-page Sengoku Basara Series Official Anthology Comic: Gakuen Basara 5 will be released on 28th March 2013 and cost ¥1,029. 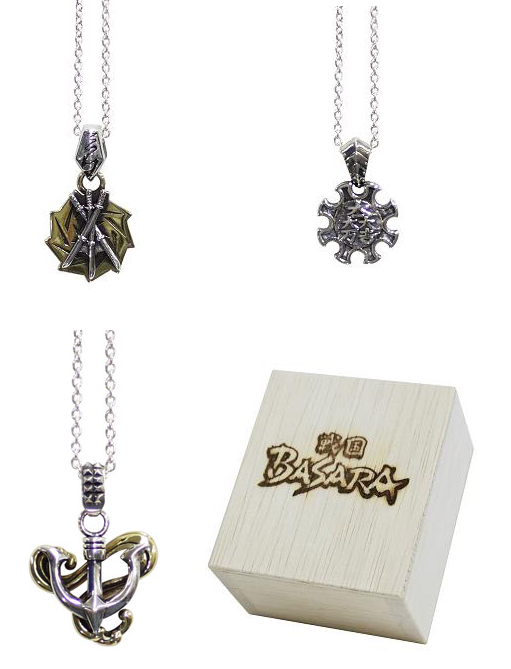 E-Capcom has listed a second batch of Sengoku Basara Silver Pendants for release in March. The three designs based on Date Masamune, Chousokabe Motochika and Ishida Mitsunari all sold out when they had a limited release back in December last year. They're not cheap at ¥8,190; as E-Capcom don't ship overseas, ordering from a retailer such as AmiAmi will be the best way to buy one. There's also some more general Capcom merchandise on the way. Masamune and Kojuurou feature on a protective film cover for the iPhone 5; when in use, it's a transparent plastic cover for your screen with an attractive border. When you turn your phone off, however, emotionally charged dialogue from the pair will be visible on the unlit screen as pictured below. I don't even have an iPhone 5. Is it wrong to want to buy the cover anyway? The cost for this item is ¥1,029 and AmiAmi are offering a discount at the moment. Both the IC card stickers and the iPhone 5 cover will be available on 25th April 2013. This isn't all, though; a book is on the way which collects the Sengoku Basara Science Laboratory series, but I'll say more on that when I have time to translate the final article in the series later this week. We already know that Sengoku Basara Magazine will debut around the end of March too, so with that and Butai Sengoku Basara 3 ~Setouchi Kyouran~ coming to DVD next month it's going to be an expensive time of year.